Commenting on Prime Minister Ranil Wickremesinghe‘s pledge to act on the OISL war crimes report to be published in Geneva next month, the Transnational Government of Tamil Eelam (TGTE) says that Wickremesinghe has failed to explain the credibility of his government on why during his seven month in office failed to give access to the OISL team. Issuing a statement the TGTE said; “This seven month old regime was voted in on trust, given time and space but failed to deliver or even built up trust or confidence that the people expected of them, for transparency, good governance, justice, accountability, a process for an honest reconciliation and for a permanent political solution for the Tamils. Why proscription of individuals and organization is still current. “This is again, unlike the confrontational previous regime as he claims, a well-orchestrated, calculated Sri Lankan Government ploy to derail international investigation. The new regime has plenty of evidence if they really wanted to bring law and order, good governance and justice, through domestic prosecution, however trivialized the depth and magnitude of the atrocious crimes committed. They had the opportunity to do it and prove with good faith, but on contrary continued to drag on from the previous processes to protect, promote and continue to make further political appointees. “It has been the belief in some quarters that the changing of the guard would result in change in institutionalized impunity in Sri Lanka. The Tamils have seen numerous regimes changes with promises since Sri Lanka becoming an independent State in 1948, and none of the regimes made any sincere effort to address Tamil grievances. 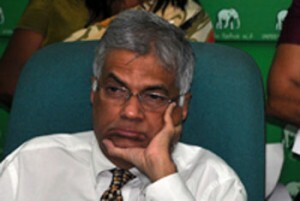 “The promotion of former Army Chief Sarath Fonseka to Field Marshall status and the recent appointment of the former Commander of the notorious 57th division, Major General Jagath Dias, to Army Chief of Staff, both of whom have been implicated in grave international crimes by reputable INGOs, is not only a slap on the face to the victims, but also to the OISL, an open flaunting of the accountability demanded of the Sri Lankan State. “So far, none of the Sri Lanka’s domestic mechanisms, commissions, including the one that had the International Independent Group of Eminent Persons, has been successful. Accountability and justice are processes that must be credible in the view of the victims, ensuring the free participation of the victims, and complying with international norms and standards. Further, given that the exclusively Singhalese Sri Lankan military apparatus is still intact, and given the intense militarization of the NorthEast where the Tamil victims live, the Tamils will continue to be fearful to participate in any in- country process. « Whither The Old Left?